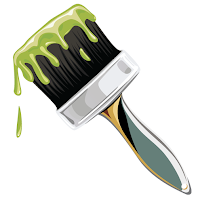 I'm an incredibly fussy painter. This fact is of much amusement to my friends, because I can't resist hand painting icons, perfect orange stripes and other painstaking details. Things get worse. Tau were meant to be my 'speed paint' army despite being the neatest of all my Warhammer 40k armies -ever! Who'd have thought that a base coat and a highlight, plus some orange stripes would be so time consuming? It takes me 2 days to complete a Tau Battlesuit. It takes James 3 hours (at the most) to finish 10 Space Marines. I've been reworking my army a lot recently and I have to confess that I dread adding new units, simply because it takes SO LONG for me to paint anything. Meanwhile James is dry brushing his Dark Angels and Marc is stippling his Orks (for a nice rust effect). They're both dirty painting methods, but the results are good and the production rate is quick! Now that I've hopped back aboard the Space Wolves bandwagon with Big Jim, it's time to think about production speed. Not only for my new Space Wolves army, but for the Tau army too. When we were at Warhammer World last weekend we saw some fantastic armies. Most of which had only been quickly painted. They were for the most part a basecoat, perhaps a wash and a drybrush. I looked closely at a few and thought "Hey, I could do that!" and without feeling any guilt from not giving my models the utmost attention to detail. Si Thorne's Ork Biker Nobz army was testament to a simple paint job being more effective than painstaking highlights that could only be seen right up close. 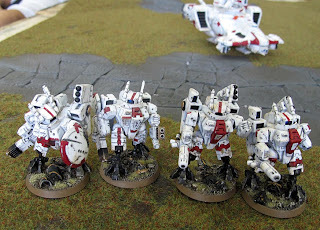 So when I saw these Tau Battlesuits on the new GW blog, I thought "Hey, I can do that!" I like the simple Robotech inspired colourscheme, the relatively dirty look, all quickly achieved with dark grey washes over a white basecoat with some additional damage added with a bit of sponge. The cuts, holes and scrapes are also a nice feature. It's certainly not clean, but it does look good and best of all, it's quick! Painting at speed is what's holding me back in the hobby. I can buy and build stuff at an impressive rate, but I can't paint it fast enough. 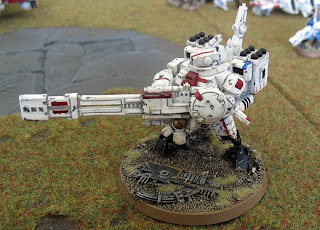 I'll have a chat to James (master of the drybrush) about painting my Tau (and Space Wolves) in a similar scheme. But essentially, it's time to swallow my pride and simply paint an army. This means selling my current Tau army after the Grand Tournament and starting afresh. I plan to build my favourite 1500 points Tau army list first, then expand again from there. So I'm going to be painting both Space Wolves AND Tau. Should be fun! Oh my...you really want to sell your army just because you want to paint the same one again, only faster? I have the same "problem" with my armies, I put a lot of effort into the paintjob and it takes my really long to get something painted. My tau tanks take about one week of nearly constant painting. That's very long for sure. But at least in my opinion it pays off, when you stand in front of your army and start thinking "damn, that looks great!". I can understand it, when one wants to get an army painted rapidly so it can be expanded with lesser effort. My tau army somehwat stagnates at the 1500 point level for those reasons. But are you really sure to get rid of such a nice army you have there only to repaint the exact same models only faster? And as you say, you are fussy concerning painting, won't you think you are a little bit disappointed when you see your new but "dirty and obviously quickly painted" army on the shelf/table? Rather than sell your amy could you not just strip the paint? Would save a lot of money. Hi Adam, I have been following your blog now for ages, but this is my first comment that i have left for you. going off on a sidetrack to wot i was going to be saying, I would just like to say "DONT DO IT!!!" dont sell your army; just add to it and paint your additions basic until u feel free to add a lil more detail. Anyway, now that i've got that off my chest...back to my main comment. Also I feel that some of your problems with dealing with charging enemies is due to you not taking advantage of any pinning weapons. You should give your fire warriors carbines,(i know this means converting your current/ or buying new ones)they can hold back advances. I personally dont like stealth; too expensive, and cant make use of their stealth when they are in shooting range. If you are to make any changes then i think this is where you should start. by dropping the stealth you could perhaps enroll some vespid and/or possibly build up your current squads of fire warriors; 6 f/w's just aren't effective even when under use of a markerlight. (you know the statistical outcome of this as you have mentioned it on a few occations)but 8 or more f/w's with carbines can at least hold back and kill the occational 1 to 2 foe while falling back from pinned foe and finish them off through a cross-fire; such as your vespid. I wont bore you as others due about using P'finders, but perhaps next time you use them set them up so that your opponent (marc -lol) comes falls charges into them range of fire instead of sending them forward on 1st/2nd turn. I hope my comment was helpful even If you dont change your tactics and may hopefully give you a little hindsight into your help for changing tactics in the future. There is more i'd like to suggest, but i'll leave that for another time. good luck with the Greater Good. I am just getting started and I have been using a quick and dirty scheme from the beginning. Rarely does a game go by that I don't get a positive comment on my army. However, I have repainted my army at least twice as my skill grows. Rather than sell your army you could save some money and invest in a couple of gallons of Simple Green to strip your models. Hey! I chose that scheme too! Only I got mine from the cities of death cover. Apparently it's the colours of an Enclaves army (Commander Brightsword), I've never even heard of robotech. Quick suggestion, if you're going to implement the dust-stained look then drybrush with Graveyard Earth straight over the basecoat, looks phenomenal. I suffer from this problem myself, so I can sympathize. My current Space Marine project is exactly what you've hinted on in this post, I've compromised quality with ease & speed of production. I have to admit. I love having a mediocre army that's fully painted vs. one I've painstakingly painted to 'Eavy Metal standard. Why? It's a fully painted army, I can pump out more relatively quickly when needed, and mostly because I'm not worried about handling or breaking my prized models that I've worked so hard on. Before you sell your gray Tau, at least buy a new battle suit and paint it up in the new scheme to be sure it's going to be as fast as you think. It may take longer... Sometimes you have to try something yourself. I'm really a beginner, but I'd be really interested in this quick and dirty scheme. How is it made? I'm not a good painter, and I wanted my tau army to be worn-out anyways.